Wednesday, Jan. 16, 2019, 11 a.m. – 2:30 p.m. 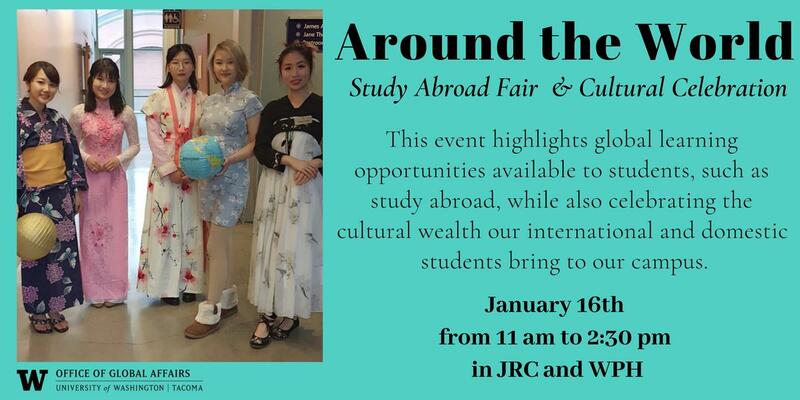 This event highlights global learning opportunities available to students, such as study abroad, while also celebrating the cultural wealth our international and domestic students bring to our campus. Visit the Study Abroad Fair to learn about the many new study abroad opportunities and scholarships available to UW Tacoma students. Talk with program faculty directors and study abroad alumni! Visit the Cultural Celebration, where students will be showcasing countries or cultures and facilitating interactive and educational activities. Each table will focus on a region, language, or country or an element of culture, such as - music, art, food, dance, language, fashion, etc.